— Hair, "Age of Aquarius"
Something in the plot depends on some stars or planets lining up in a particular order at a certain time (an event known in astronomy as syzygy). Often doomsayers claim this will be the cause for The End of the World as We Know It, whether by breaking the tectonic plates, causing a shift of the poles, changing the Earth's rotation..., or introducing the Eldritch Abomination. When it overlaps with Significant Birth Date, it can occur in the Back Story and still complicate the plot; this can produce The Chosen One or the Big Bad. Celestial Deadline: where you can use these sorts of events. Total Eclipse of the Plot, a Sub-Trope which involves a solar eclipse. Vicious Cycle, because these alignments tend to occur at regular intervals. Example: The Dark Crystal (Great Conjunction of suns). Artistic License  Astronomy: some examples fall into this category. Liminal Time: Another way to lend significance to a date. A Year and a Day, where the countdown is not to some specified event but is tied to the passage of a fixed length of time. Saint Seiya: During the Hades arc in which the 9 planets (remenber, back then Pluto was still consider a planet) will all align together and cause the Greatest Eclipse. Age of the Wolf: A werewolf prophecy says that humanity can be wiped out if a particular human is sacrificed when the great moon aligns with the stars. In Bring Me To Life, it's eventually revealed the First's plan revolves around an even known as the Awakening, which is when every world, star, and dimension in The Multiverse is in perfect alignment with each other, something that only happens every half billion years. When this happens, the First will be able to access the Eye of Creation and use its raw power to destroy all of reality. Hercules: the Titans can only be freed when the planets line up. Notably, it is only the further six planets (well, five planets and Pluto, but it was considered a main planet back then) which apply, as their alignment basically reveals the location of the Titans' prison and unlocks it, enabling Hades to free them. Part of the All There in the Manual explanation for Elsa's powers in Frozen is this. According to Word of God, 1,000 years after Saturn is in a certain alignment, a child is born with ice magic. This was going to be explained in the film itself but was cut for not being important to the focus of the film. TMNT (2007): the portal to the netherworld opens when the stars line up. Word of God explains that Elsa from Frozen is the first person in over 1,000 years to have been born with ice powers as a case of this, with the only explanation in the film being that she was simply born with it. The Coneheads' symbol of their home planet represents three crescent moons overlapping. When the Coneheads finally return, it does indeed have three moons that periodically align in this way, instigating a major festival. The plot of Pitch Black revolves around a 22 year cycle eclipse of all the suns of a planet. In Highlander: The Source, the entire galaxy—every single celestial body from moons to planets to stars, and all of them in the solar system—comes into alignment, all focused on Earth. Even non-scientists and children knew better, but that didn't stop the writers. Well, that could just be...orbital wobble. Omen III: The Final Conflict. The alignment of three stars creates the second Star of Bethlehem, a sign of the Second Coming of Christ. Lara Croft: Tomb Raider. A magic item that can be used to control time can only be accessed during a planetary alignment that occurs once every 5,000 years. The Dark Crystal involves a triple-sun alignment called the Great Conjunction. 2012 vaguely waves at this, with the Critical Research Failure of another planet visible from Earth's orbit and Jupiter visible from Saturn, but apart from Woody Harrelson's free-associating Conspiracy Theorist, it doesn't come up again. In The Scorpion King, the villain will allegedly become invincible when the Moon is in "the House of Scorpio". The Mac Gyver Lost Treasure Of Atlantis TV-movie features this. For some reason, the planets are visible, to the point where they would actually collide with each other. Pee-wee's Big Adventure - after his bike was stolen, Pee-wee has all his friends assemble in his basement as he manically pieces together clues to the crime - including planetary alignment. A major plot point of Thor: The Dark World is the Convergence, an alignment of the Nine Realms that only happens once ever 5000 years, causing portals between the worlds to open at random. Malekith intends to use the Convergence to spread the Aether across the universe, destroying everything. 2001: A Space Odyssey: In "The Dawn of Man", the first Monolith appears to the Australopithecines when the Moon is near solar eclipse; the Monolith on the moon sends its transmission to Jupiter when the Moon is near lunar eclipse. 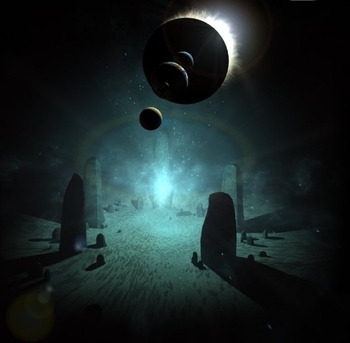 In "Jupiter and Beyond the Infinite", the portal opens with an alignment of the Monolith and the major Jovian moons. 5/5/2000, ICE: The Ultimate Disaster claimed that on the title date a planetary alignment would cause catastrophic disaster on Earth. Robert A. Heinlein's Farmer in the Sky featured a dramatic alignment of the moons of Jupiter which the protagonists watched from Ganymede. In Kushiel's Mercy, the Carthaginians take advantage of an astrological event to put a spell on the entire city. One of the stories in Star Trek: The Brave and the Bold involves a Bajoran prophecy suggesting Bajor will be at peace when all the planets moons fully align. The bitter old terrorist Orta seeks to use a powerful artifact hes unearthed (created by Sealed Evil in a Can Malkus) to artificially move a moon and fulfil the prophecy early. Of course, he doesnt actually want peace — hes just using the prophecy as a ploy to start a conflict with the Federation. In the Cthulhu Mythos universe by H. P. Lovecraft and others, there are many references to how the Great Old Ones will return "when the stars are right". Though it's never explicitly said what that entails. In fact an alternate interpretation at least in Cthulhu's case is that it refers to the Elder-Things (who may or may not have been responsible for trapping Cthulhu underwater to begin with) which are described as having star-like heads. One of the lesser Dragonlance novels featured a portentous lunar alignment between the white, red, and black moons of Krynn, known as the "Night of the Eye". In John Brunner's The Traveller in Black series, the Traveller makes his periodic journeys when a certain array of four planets comes into alignment. Two alignments of the seven planets play a major role in the timing of the third book of the Septimus Heap series. A variation occurs in the backstory of John Bellairs' young-adult horror novel The House With a Clock in Its Walls, with black-magic user Isaac Izard obsessively searching for the right pattern of clouds to allow him to bring about The End of the World as We Know It. After he misses the moment, he creates the titular clock to try and drag time back to the right position again. In Robin Jarvis' Deptford Histories book Thomas, a constellation of nine stars in the sky signify when the serpent God of Evil Suruth Scarophion is closest to the living plane. Whose banished soul do they call back and augur in the sky? Despoiler of the ancient lands, who baked the deserts dry. Scarophion, Scarophion - the demon is close by. The X-Files episode "Syzygy". An alignment of Mercury, Mars and Uranus may have something to do with several murder cases in a small town. Astronomer Sir Patrick Moore appeared on Have I Got News for You at a time when an impending alignment of the planets was being hyped in the tabloids as a catastrophe. Angus Deayton gave him pieces of fruit to represent the planets and kept referring back to the rumors, even though what Moore was demonstrating with the fruit was that absolutely nothing was going to happen. Paul Merton: No, it won't! Patrick says it won't! Ian Hislop: There isn't a lot of point getting an astronomer on if you're just going to read out a load of balls! Paul Merton: Ian, the correct term is spheres. On another occasion, Sir Patrick announced on radio that a rare alignment of the planets would temporarily reduce the Earth's gravitational pull, as people could discover by jumping up and down. Several listeners called in to confirm this, one man claiming that he had bumped his head on his ceiling. The fact that the broadcast went out on April Fool's Day seemed to have escaped their notice. The first half of Rescue Sentai GoGoFive had the Saima preparing for the planets to line up into the Grand Cross so they can bring back Grandienne. This carried over to their American counterparts in Power Rangers Lightspeed Rescue. Like with Dengeki Sentai Changeman and Halley's Comet, in August 1999, the Grand Cross occurred as well. In episode two of Tensou Sentai Goseiger, Hyde is told the Gosei Angels can only return to their own world during a solar flare that occurs once every 200 years. Unfortunately, at that time they are fighting a Monster of the Week, and he decides to remain on earth instead to protect the earth with the others. In the Doctor Who serial "The Masque Of Mandragora", Hieronymous invokes this. He even appears to believe it. The series four finale ("The Stolen Earth"/"Journey's End") had twenty-seven planets stolen from their home systems and placed in perfect alignment by the Daleks to create an engine to be used to amplify the "reality bomb" that would destroy every universe in all of reality. Star Fleet has all the planets in Earth's solar system aligning at the end of the year 2999 for the dawn of a new millenium. The Sarah Jane Adventures took this trope Up to Eleven with the Ancient Lights. Their master plan relied on every star in the universe entering into a very specific pattern. The Tin Man mini-series has the Big Bad plan to use a Magitek machine to "freeze" the Outer Zone's two suns in a permanent position behind the moon, thus placing the OZ in perpetual darkness. Land of the Lost (1991) had an episode where the animals were going mad due to the world's three moons aligning. Buffy the Vampire Slayer: In Season 5, it's stated that the Key can only be used to open portals at a specific time and place, and Glory's minions have to repeatedly remind her she's running out of time to find it. In "The Gift," the Scoobies use this to their advantage; since the ritual can only be performed at said specific time and place, all they need to do is keep Glory occupied until her window of opportunity passes. MacGyver (1985): "Lost Treasure Of Atlantis" features this. For some reason, the planets are visible, to the point where they would actually collide with each other. It has been suggested that the star which guided the Wise Men to Jesus' manger was not actually a star, but a particular astronomical alignment. Adventure "Sign of the Times" in generic AD&D2 supplement Treasure Maps . Every 700 years during a specific astrological conjunction of planets, moons and stars the king of a desert empire will fall ill and die, and his son will take his place. The new king will become evil and cruel, raising taxes and invading other countries. Natural disasters (famine, pestilence and drought) will ravage the land. Al-Qadim setting, in The Complete Sha'ir's Handbook, has a Wizard kit "Astrologer", with a shade of Mad Scientist, who have to play with an orrery and may have up to 3 bonus spells discharged at will, but conditioned on visibility of one of 12 constellation. Violet Dawn setting has feat "Secrets 0f the Stars" in one tradition. It allows to predict a "propitious time" for some or other activity involving XP cost (i.e. item enchantment or casting powerful spells), sticking to which halves said cost. The Forge World Warhammer 40,000 supplement The Fall of Orpheus's villains, a slumbering (and insane) Necron dynasty, come to full wakefulness immediately following a binary system's two suns suddenly go nova, altering the appearance of the stars in the Orpheus Sector and meaning that The Stars Are Right once again. Needless to say, it ends badly for the population. In Rifts, The Great Cataclysm occurring during (and in part because of) a rare conjunction of the planets. It caused the Ley Lines to surge with power. This combined with a couple other factors upset the Earth's magical balance, causing The Coming of the Rifts. In Yu-Gi-Oh!, this is referenced in two cards, Grand Convergence and the anime-exclusive Planet Alignment. The former destroys all monsters on the field, the latter just your opponent's, but both feature planetary alignments in their card art. Hair references the trope during the "Age of Aquarius" song: "When the moon is in the seventh house and Jupiter aligns with Mars/then peace will guide the planets and love will steer the stars"
Subverted in Crash Bandicoot 2: Cortex Strikes Back. Crash's goal is to gather Crystals so Cortex can use them to safeguard the world from a planetary alignment. Of course, he's lying - the Crystals are actually to fuel a space weapon. "When the moon is in the seventh house, and jupiter aligns with mars...then peace will guide our planet and love...? Naw, it'll never happen." Pious Augustus of Eternal Darkness is counting on the planets aligning to channel enough power to summon his Ancient into the mortal world. He's been waiting for two millennia for this event which of course is at the Turn of the Millennium. The Grand Cross planetary alignment is a major part of the plot of Persona 2: Innocent Sin. In Eternal Punishment, it's become a minor background element whose only significance is that absolutely nothing of note happened during it... acting as an absolute confirmation that the events of the prior game never came to pass in this timeline. Master of Magic has astrological conditions — Conjunctions, Good Moon and Bad Moon — that enhance one type of power sources and diminish others. These are really random events, though, i.e. have unpredictable start and end times. In Psygnosis' Lander, a conjunction of all nine planets in our system allows space tourists the once-in-a-lifetime opportunity to visit all the planets in a single cruise. A Miracle attack in Animal Kaiser called "Aligned Planets". Apparently, when this happens, all of them smash into Earth and destroy it in a cutscene... and the opponent animal takes heavy damage, with Earth no worse for the wear. Ultima VII: The astrological alignment of the nine planets of the solar system occurs once every 800 years, thinning the barriers between worlds, and increasing magical activity. During this event, The Guardian attempted to enter Britannia through the Black Gate. RuneScape: The Mahjarrat perform the Ritual of Rejuvination, where one of them is sacrificed to extend the lives of the others, during a planetary alignment that happens approximately once every 500 years. The planetary alignment isn't actually a necessary component of the ritual, as it can be performed without it. They just do it at that time because once every 500 years is often enough to keep the surviving Mahjarrat alive, but not so frequent that their numbers would be reduced too quickly. Wapsi Square: You know what happens in 2012 when the Mayan calendar runs out? "Groundhog Day" Loop! Eerie Cuties has a vampire born on the first Sunday after the first full moon after the vernal equinox (a.k.a. Easter) who does not drink blood. In Cucumber Quest, the Nightmare Knight returns every 5,000 years. Rocko's Modern Life episode "Born to Spawn." Filburt's breed of turtle has a mating season that occurs when all the planets are in alignment, and is hypnotically irresistible. In the end, Heffer has a similar problem starting when all the fast food restaurants go into alignment. In Teen Titans it's said that Trigon could only arrive on Earth when the planets align. We don't actually get to see any planetary alignments, but there is a freaky eclipse going on simultaneously. In Invader Zim episode "Career Day", some paranormalists discovered that when a galactic equinox occurs, aliens that are living off their home planet will go through a hideous molt for a few minutes. Zim just happened to be unlucky enough to experience it. Major plot points of the nine-month (literally three seasons) storyline of Avatar: The Last Airbender include the solstices, a solar eclipse, a (man-made) lunar eclipse, and a comet with a 100-year cycle. The Legend of Korra: Every 10,000 years, the planets align in what is known as the "Harmonic Convergence"; on that day the spirits Raava and Vaatu do battle to decide the fate of the world, and while neither one can permanently kill the other it's a very bad thing for everyone if Vaatu wins. During the previous Convergence, the first Avatar, Wan, merged with Raava and sealed Vaatu in a tree. The next Convergence is on Korra's watch. In My Little Pony: Friendship Is Magic, Nightmare Moon is said to return on the longest day of the thousandth year, when the stars will aid in her escape. In Teenage Mutant Ninja Turtles (2003), the underground city's crystal technology is recharged completely with the coming of the planetary alignment, which allows the city's inhabitants to revive themselves. In the Spongebob Squarepants special "Spongebob vs The Big One", Jack Kahuna Laguna explains that when the planets align, it creates an incredible wave called The Big One, which the heroes can use to surf back home. Unfortunately, The Big One also demands a sacrifice for the rest to survive. Optimus Prime: And it was written in the Covenant of Primus that when the forty-seven spheres align, a perpetual conflict will culminate upon a world forged from chaos; and the weak shall perish in the shadow of a rising darkness. Somewhat Hand Waved by the fact that gravitational forces from those planets were somehow acting on Unicron, causing him to wake up. According to the introductory narration, the reincarnation of Count Duckula may occur by means of a secret rite that can only be performed once a century when the moon is in the seventh house somewhere. It is imperative to make sure blood is used in the ritual however, otherwise there will be side effects. Camp Lazlo: Small children depend on the alignment to gain maturity to watch horror movies. It's supposed to occur everytime someone reaches puberty but it seems to have missed Mr. Lumpus. Xiaolin Showdown: On the day the planets aligned, Mala Mala Jong reforms and then uses the Ring of Nine Dragons to split into four beings collectively called the Fearsome Four. Luckily, this reveals a new Shen Gong Wu artifact to defeat him, the Emperor Scorpion, which lets him be controlled. In ¡Mucha Lucha! : The Return of El Malefico, El Malefico Can only be set free when this happens. If he's not put back by the time they come out of alignment, he becomes unstoppable. Scooby-Doo! Mystery Incorporated had a story arc leading to an alignment of the planets with a Planet X, which was inhabited by what was believed to be the first recorded history of gods. At that point, the curse of that timeframe, Nibiru, would be released and ravage the earth and we do mean ravage. In "The Picnic", a planetary alignment once a millennium brings forth a transdimensional creature who will grant one wish to whoever is present. Lord Hater and Emperor Awesome fight over the spot where the creature will appear and wish to be ruler of the universe, while Wander is there just to watch the alignment. In the end, Lord Hater gets the wish, but wastes it on wishing that Wander leave him alone for five seconds. In "The Time Bomb", an annual planetary alignment provides the perfect set-up for a massive race, the Galactic Conjuction 6000. In She-Ra: Princess of Power, there was an attempt to kidnap Prince Adam from Eternia by using a mirror which can open portals. The problem is, it only works when the two moons (two for each planet, that is) are aligned. The attempt is successful, but when Hordak later orders to use it when the moons aren't aligned, it turns out to be a really bad idea. When the Three Suns of the planet Prysmos align at the beginning of Visionaries, the planet's advanced technology starts to fail. Before long, all electrical energy has been depleted and an Age of Magic has begun, but it takes a few years before people believe this. He-Man and the Masters of the Universe (1983): In "Teela's Quest", Mer-Man explains the the sea demon Bakull can only be summoned when the stars are in perfect alignment, which only happens every twenty years. Voyager 2's trajectory took it past Jupiter, Saturn, Uranus and Neptune, due to a planetary alignment that only occurs once every two or three centuries. On roughly December 21 every year, Earth, the Sun, and the galactic center line up (almost: the galactic centre (Sagittarius A*) is seven degrees away from the ecliptic). Some people, not realizing it happens every year, predicted this would have dire consequences in a specific year. The "Jovian-Plutonian Gravitational Effect" hoax of 1976 by the British astronomer Patrick Moore. The guy stated to radio listeners that an alignment of Jupiter and Pluto on 9.40 am, April 1, 1976, will noticeably reduce gravity on Earth. Many believed. The phrase "when the stars are right," along with its variants, is sometimes used to refer to necessary conditions which are difficult to arrange or cannot be readily determined, especially referring to computer use or programming.